China has become the third-largest purchaser of US-made products and services, spending USD 165 billion in 2015 alone. In just 10 years, that figure is expected to increase to USD 370 billion. By 2030 this figure will reach USD 525 billion, or 10 percent of total US exports, reflecting the enormous size of China's market and the faster pace in the projected growth in its cohort of middle class consumers. Chinese firms are beginning to invest in the United States. China invested USD 14.8 billion in the United States in 2015, up from USD 277 million in 2000. Based on data from BEA, more than 38,000 people are employed at US affiliates of Chinese firms. 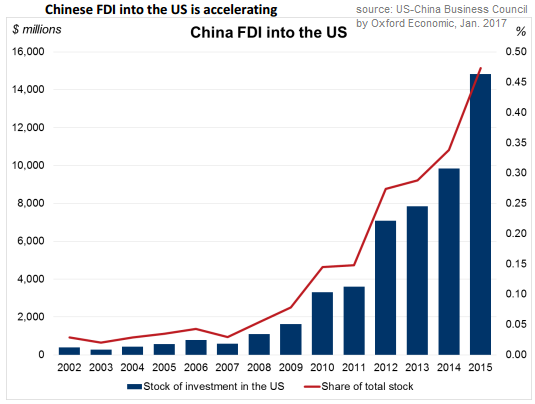 Taking into account how these affiliates interact with the rest of the US economy through the supply chain, one may estimate that this Chinese investment in the United States supports a total of 104,000 jobs and USD 10.8 billion in GDP. 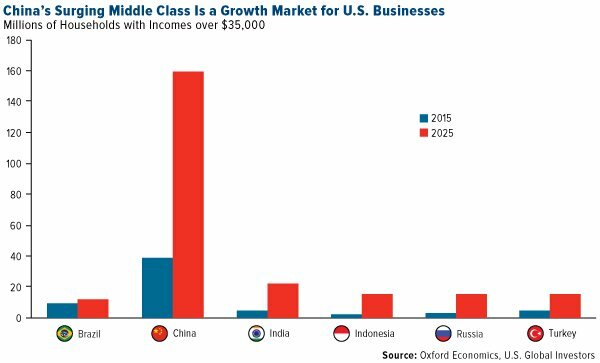 ...represents a substantial opportunity for US businesses - by 2025, 160 million consumers in China will have incomes greater than USD 35,000, up from 40 million today! As the size and purchasing power of the Chinese middle class grows, these consumers will demand more of the services and higher-end products that American companies export. AGAIN(! ): While some 40 million Chinese households now boast annual income in excess of USD 35,000, that population is projected to rise four-fold, to 160 million, by 2025. As China's middle class expands, demand for American-made goods and services is expected to rise as well. Ford and General Motors have already established major footprints in China, now the world's largest automobile market. In the first half of 2016, GM sold 1.8 million vehicles in China - 400,000 more than it sold in the United States.